For the first time ever in the history of choosing Color of the Year, Pantone couldn't just settle on one. Instead, they chose two. "Why rock the boat?," you ask. Well, you might be a bit surprised at the answer. Rose Quartz, a pastel pink, and Serenity, a pastel blue, are often associated with the gender roles we place on babies and young children. As we're heading into an era when gender might become a thing of the past (in terms of fashion and roles), Pantone wanted us to challenge our use of colors in order to make equal and eliminate gender entirely. Also, Pantone would like us to think of Rose Quartz and Serenity as "yin and yang"--as a "balance between a warmer embracing rose tone and the cooler tranquil blue, reflecting connection and wellness as well as a soothing sense of order and peace". That's all good and dandy for the progression towards a more accepting and healthy society, but how the heck do we apply this to makeup?! It's much easier to get away with it through clothing, jewelry, and even nail polish, but no one wants to end up as a meme floating through the infinite span of the internet because of a darn trend. 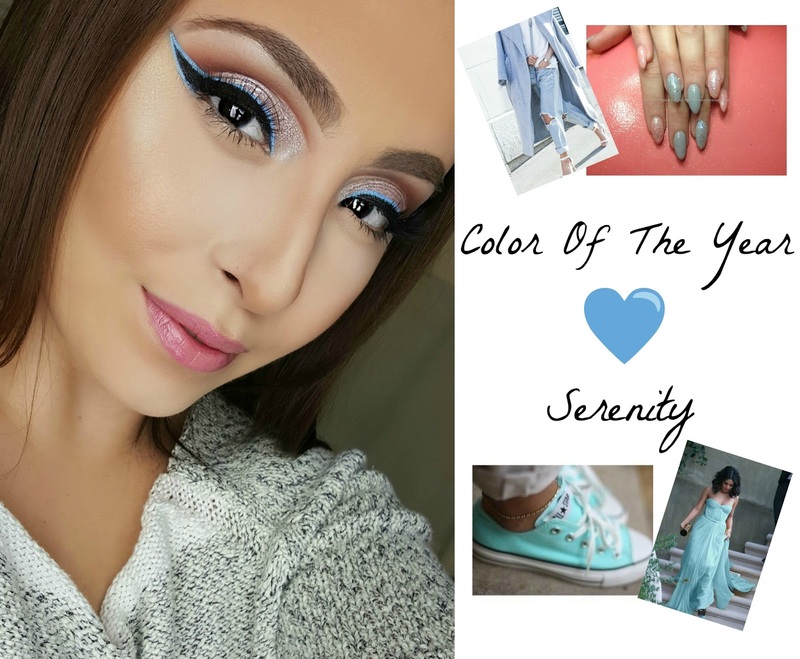 Luckily, I've come up with a couple of ways you might be able to incorporate Serenity into your wearable makeup routine. Wearing blue makeup of any kind could easily make you look like you're stuck in the 80s, but it's not entirely impossible to pull off. One of the easiest ways to pair it with your current makeup style is by introducing it into your eyeliner routine as I have done in my makeup look for today's post. 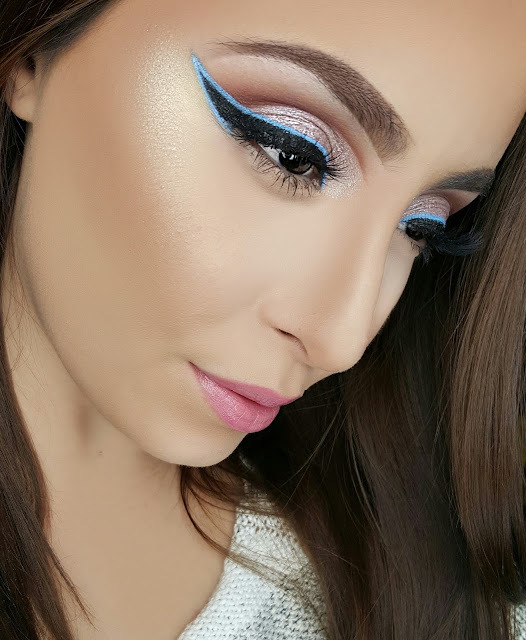 Now, if winged eyeliner is too bold for you, think about using it on your waterline or lower lash line as a pop of color. I like Inglot Gel Liners because they stay put all day and don't irritate my very sensitive eyes. Also, items like the Inglot Rainbow Eyeshadows are helpful because you have multiple tones of the same shade at your disposal. If baby blue is just too bright for you still, try going with its lighter cousin, icy blue. Icy blues like this Nyx Prismatic Shadow make for really fun inner corner highlights and that subtle tinge of blue makes the whites of your eyes look extra bright in case you've been pulling that all-nighter again. Lastly, and for the more daring of my fellow beauty addicts, there is a new trend that has crept up in the highlighting world and will definitely make its formal debut in 2016--and that is colorful highlights. I know, it sounds very scary, but there's a time and place for everything, right? 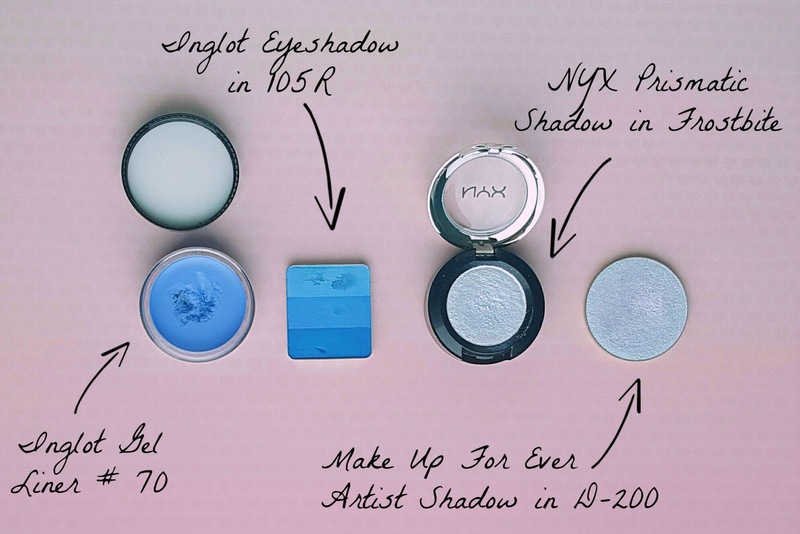 A good way to experiment with such a fun trend is by using a duochrome eyeshadow or pigment as a cheekbone highlight like the ones in the MUFE Artist Shadow range, which reflects different colors depending on how the light is hitting you. So have fun and remember there are no rules to makeup! Wow, so beautiful! I love both the colours Pink Quartz and Serenity so I'm very happy. You look absolutely gorgoeous - thanks for sharing!